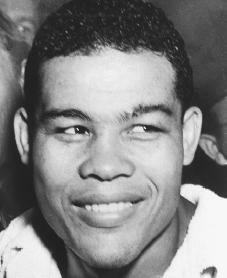 African American boxer Joe Louis was world heavyweight champion from 1937 to 1948. He defended his title twenty times in four years. Joseph Louis Barrow, born on May 13, 1914, was the seventh of eight children of Munroe Barrow and Lily Reese. His father was an Alabama sharecropper and died when Joe was four. His mother took in washing to support her family. Joe was close to his large family, particularly to his mother, from whom he inherited a deep religious sentiment. His mother married Patrick Brooks, with children of his own, when Joe was seven, and the family moved to Detroit, Michigan, in 1926. After Brooks lost his job, Joe and his brothers shined shoes, ran errands, and sold newspapers before and after school to help out the family. Joe also worked as an assistant to an ice-wagon driver. He later said that carrying heavy ice helped him to develop his big shoulder muscles. As a teenager, Joe was the best boxer of his group. At nineteen he won the National Light Heavyweight Amateur Crown of the Golden Gloves in 1933. Louis received his ring name from one of his managers, John Roxborough, who found the name Joe Louis Barrow too long. Jack Blackburn, a very knowledgeable boxing man, was Louis's trainer. He taught Louis how to punch and worked with him to develop his body coordination. Before Louis became champion, he was beaten once, by Max Schmeling in 1936. The following year he defeated Jim Braddock for the championship. In 1938 Louis met Schmeling again and knocked him out in the first two minutes of the first round. Louis fought boxers including Billy Conn, Tony Galento, Rocky Marciano (1923–1969), and "Jersey Joe" Walcott (1914–1994). He won nineteen other title fights. During World War II (1939–45; a war fought between the Axis powers: Germany, Italy, and Japan—and the Allies: England, France, the United States, and the Soviet Union) Louis was drafted, served faithfully, and fought two bouts for army and navy relief. The curse of many victories in a short period of time was the accumulation of a heavy tax burden. For example, Louis won $349,228 for his victory over Schmeling and $591,117 for beating Conn. In his entire ring career he earned $4,677,992. But his federal income taxes were $1,199,000. When penalties were assessed, taxes became astronomical. Another source of trouble for Louis was his partnership in a public relations firm. In the early 1960s this firm entered into a contract with Cuba for $250,000 to promote tourism. Although this was not illegal, it was considered in poor taste to deal with a country with whom the United States did not maintain diplomatic relations. Louis's other business ventures included the Joe Louis Food Franchise, a chain of food shops he opened in 1969 with his former ring rival Billy Conn. The former champ also served as a celebrity greeter at the Caesar's Palace Casino in Las Vegas, Nevada. Unfortunately, drugs took a toll on the once indomitable (not able to be beaten) champion in his final years. In 1969, he was hospitalized after collapsing on a New York City street. While the incident was at first credited to "physical breakdown," Louis later admitted to cocaine use and fears of a plot against his life. The following year, Louis spent five months in the hospital suffering from paranoid delusions (irrational anxiety and fear toward others). Strokes and heart ailments caused his condition to worsen. He had surgery to correct an aortic aneurysm (abnormal widening of a blood vessel) in 1977 and was thereafter confined to a wheelchair. Despite failing health, Louis still found time to attend major boxing events. On April 12, 1981, he sat ringside at the Larry Holmes and Trevor Berbick heavyweight championship bout at Caesar's Palace. Hours after the fight, Louis went into cardiac arrest (a heart failure) and died at the age of sixty-six. In 1994, the bronzed boxing glove that Louis used to defeat Max Schmeling was donated to the city of Detroit by the Michigan Jewish Sports Hall of Fame. Dubbed "The Glove That Floored Nazi Germany," it was enshrined in a plexiglass case at the city's Cobo Center, a monument to Louis's enduring legacy. Bak, Richard. Joe Louis: The Great Black Hope. Dallas: Taylor Publishers, 1996. Barrow, Joe Louis, Jr., and Barbara Munder. Joe Louis: 50 Years an American Hero. New York: McGraw-Hill, 1988. Louis, Joe, with Edna and Art Rust, Jr. Joe Louis, My Life. New York: Harcourt Brace Jovanovich, 1978. Mead, Chris. Champion—Joe Louis, Black Hero in White America. New York: Scribner, 1985.